Love this Martha Stewart Collection 2-Quart Enameled Cast Iron Pineapple Dutch Oven for just $27.93 (Retail $99.99). This dutch oven is made from durable cast iron with a non-reactive enamel interior that doesn't need to be seasoned. 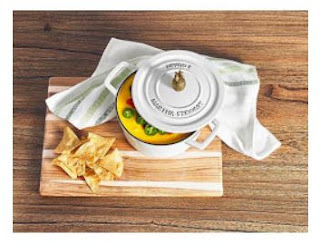 It also features over-sized stainless steel handles to keep your hands cooler when removing it from the oven and it can withstand temperatures of up to 500°F so it's perfect for slow cooking or roasting. Shipping is free with any beauty purchase or choose free in store pick up if available near you.